The banner that became a focal point of David Moyes's struggles at Manchester United manager has now been removed. 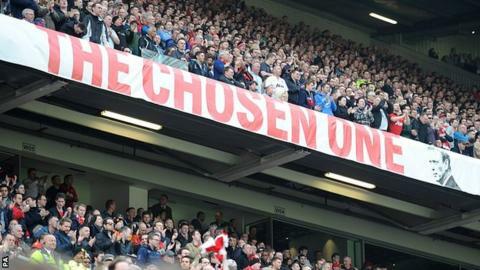 'The Chosen One' sign has hung from the Stretford End at Old Trafford since August but has been taken down ahead of the weekend's game with Norwich. Stretford End Flags, which had the banner made, may donate it to the National Football Museum in Manchester. The banner was made after Sir Alex Ferguson anointed Moyes as his successor before quitting last May. A Stretford End Flags spokesman previously told BBC Sport that donating the banner was one of a number of options under consideration. There had been intense debate over whether the banner should have remained as long as it did. Fans who were openly critical of the former Everton boss called for its removal in the wake of a succession of damaging defeats. Those were resisted, but following Tuesday's sacking of Moyes it has now been removed. A National Football Museum spokesman said: "Every object within our collection needs to fit within our strict collections guidelines. "We are offered objects on a regular basis and, while we are always grateful for these offers, we often have to decline for reasons of space and because it doesn't fit within our guidelines."